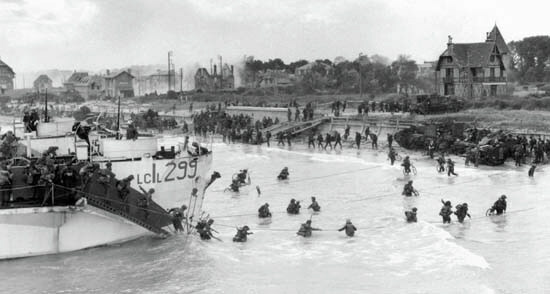 JUNO was the codename assigned to the 3rd Canadian Infantry Division's landing area and was sandwiched between the British landings on Gold Beach to the west and Sword Beach to the east. D-Day Canadian troops' objectives were to push 11 miles inland to reach the Caen-Bayeux road, to capture the airfield of Carpiquet to the west of Caen and link up with British troops landing on both sides of them. However, the delay in getting the first waves inland and off the beaches meant that reinforcements were also delayed in coming ashore. Therefore, the leading units lacked the strength to push to Caen itself. This Center was conceived in the 1990's by Veterans who felt that the contributions and sacrifices of Canadian soldiers during WW2 were not properly commemorated in Normandy. Opened in 2003, it is the only Canadian museum in Normandy, relating the story of life in Canada before the outbreak of the war, Canada’s civilian and military contribution to the war effort and also offers insight into contemporary Canadian society. In the Canadian military cemetery at Bény sur Mer Reviers lie the remains of the 335 soldiers of the 3rd Canadian Division who came ashore at JUNO beach on June 6th 1944 and were killed during the assault on the beaches. Alongside them are another 1694 Canadian soldiers and 15 airmen who lost their lives during the fighting on the advance inland. 19 of them are unidentified. Also buried at Bény are one airman and three soldiers from Britain and a single French soldier. Containing in total 2048 WWII burials, this cemetery is one of the 18 Commonwealth cemeteries in Normandy, built and maintained by the Commonwealth War Grave Commission.